The Smith & Wesson 500 is one of the all time great handguns. Big, sturdy, a blast to shoot (pun intended), and it just looks awesome. This revolver is massive and it’s size brings out curiosity in whoever sees it. If you have one of these guys, you are probably wondering if there is a good holster to carry it in. I’ll go over a few options for you, but I’d like to share my top pick first. 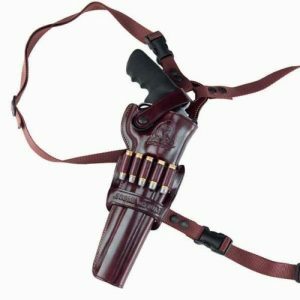 I think the best holster for your Smith & Wesson 500 is the Outbags OWB holster. This is a nylon holster with ammo loops, a thumb strap, and a removable belt clip. This revolver is probably not going to be your choice for everyday concealed carry. According to Smith & Wesson’s website the stats on this revolver are impressive. The popularity of big game hunting with handguns varies from year to year. A magnum revolver, among other handguns, can be a good tool for big game hunting. Why, with long range rifles, would anyone choose to hunt with a handgun? Because handgun hunting is more challenging. For anyone who is willing to put in some effort to practice with their handgun, and willing to get a little closer to the game, handgun hunting has a thrill all its own. A handgun is more cooperative than a rifle. It is easier to maneuver and get your sights on a target quickly. When it’s holstered you won’t have a barrel hanging out to catch on things. The biggest disadvantage with handgun hunting is that you will have to close the gap between you and the game. With scopes getting better and better your options are getting better. There is some gear that is helpful when you are hunting with a handgun. Sometimes shooting a large caliber gun, like the Smith & Wesson 500, can be intimidating. Especially if it’s your first time. While these revolvers are probably not the best way to introduce someone to shooting, they are manageable and good form is paramount. Some experts say to load just one round into the chamber, the first time you shoot the Smith & Wesson 500. One of the tendencies of first time shooters, is to tense up from the recoil and accidentally pull the trigger a second time. Ensuring the gun is secure, in your hands, is the first part of a good grip. Your body’s larger muscles, in your back, will have more contractile force than the smaller muscles in your wrists and arms. A grip that enacts the back muscles will help with recoil management. A stable stance can make the difference between managing recoil and being knocked backward. Your stance should balance your weight between both feet. Standing with your feet shoulder width apart helps balance. This is the most basic gun safety rule. If everyone handled their firearm without pointing it at something they were not willing to destroy, there would be a lot less firearm accidents. If you’re not on the range, hunting, or using your gun for self defense, your gun should be stored safely where children and criminals can not get to it. Treat every gun as if it can fire at any time. They safety is a mechanical device that can fail. Never touch the trigger unless you intend to shoot to destroy. Once you have pulled the trigger you no longer have control over where the bullet goes. Don’t shoot unless you know exactly where your gun is going to shoot. Be sure the bullet will not hurt anyone or anything beyond your target. Using incorrect ammo can destroy your gun and cause serious injury. Read all the instructions and warnings that come with your handgun and your ammo. If your gun doesn’t fire when you pull the trigger keep the muzzle pointed in a safe direction, carefully open the action, unload the the firearm and dispose of the cartridge. Exposure to shooting noise can damage hearing and things can get in your eyes. It’s always wise to wear ear and eye protection. Clean your gun and check the barrel before you shoot it. Even small amounts of dirt, oil, or gunk can cause increased pressure while firing. This can cause the barrel to bulge and sometimes blow upon firing. Just like any other mechanical device, your gun will need regular inspections, and services. Check with the manufacturer for recommendations. Let’s get on with the top picks in holsters for the Smith & Wesson 500 revolver. 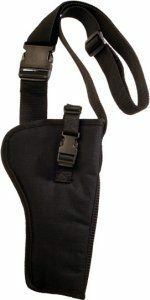 This holster comes left or right handed, has extra ammo loops, and is made of sturdy nylon. It has a thumb break that won’t slow you down while drawing. This tactical thigh holster is designed for active use. It comes with extra ammo loops, a rugged belt strap, and double thigh straps. 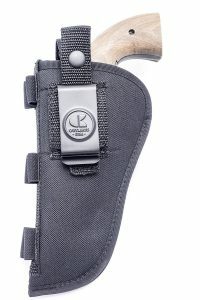 This holster will ensure your firearm stays with you no matter what activities you are involved in. Designed to keep a large handgun comfortable and accessible. This holster carries the gun diagonally across your torso. Actual placement and angle can be changed throughout the day to aid in comfort. This holster will fit the Smith & Wesson with a scope. It has an adjustable shoulder strap and a quick release thumb break. This holster was designed with outdoor recreation in mind. The harness is designed with all day comfort during activities like hiking, fishing, dirt bike riding, etc. The Smith & Wesson 500 is one of the most powerful production handguns available, and one of the heaviest. You want a holster that will handle the weight and size of this revolver with relative ease. 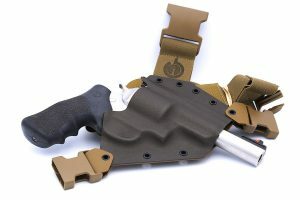 After my research, I found the Outbags OWB Holster to be the best all around holster. It’s made of nylon and does what it’s supposed to do. It keeps your 500 secure with an adjustable thumb break, but won’t slow you down too much if you come across a wild animal while you are out for a day in the woods.